This article is about the baked goods. For the mathematical constant, see Pi. For other uses, see Pie (disambiguation). Pies are defined by their crusts. A filled pie (also single-crust or bottom-crust), has pastry lining the baking dish, and the filling is placed on top of the pastry but left open. A top-crust pie has the filling in the bottom of the dish and is covered with a pastry or other covering before baking. A two-crust pie has the filling completely enclosed in the pastry shell. Shortcrust pastry is a typical kind of pastry used for pie crusts, but many things can be used, including baking powder biscuits, mashed potatoes, and crumbs. During the Egyptian Neolithic period or New Stone Age period, the use of stone tools shaped by polishing or grinding, the domestication of plants and animals, the establishment of permanent villages, and the practice of crafts such as pottery and weaving became common. Early pies were in the form of flat, round or freeform crusty cakes called galettes consisting of a crust of ground oats, wheat, rye, or barley containing honey as a treat inside. These galettes developed into a form of early sweet pastry or desserts, evidence of which can be found on the tomb walls of the Pharaoh Ramesses II, who ruled from 1304 to 1237 BC, located in the Valley of the Kings. Sometime before 2000 BC, a recipe for chicken pie was written on a tablet in Sumer. Ancient Greeks are believed to have originated pie pastry. In the plays of Aristophanes (5th century BC), there are mentions of sweetmeats including small pastries filled with fruit. Nothing is known of the actual pastry used, but the Greeks certainly recognized the trade of pastry-cook as distinct from that of baker. (When fat is added to a flour-water paste it becomes a pastry.) The Romans made a plain pastry of flour, oil, and water to cover meats and fowls which were baked, thus keeping in the juices. (The covering was not meant to be eaten; it filled the role of what was later called puff paste.) A richer pastry, intended to be eaten, was used to make small pasties containing eggs or little birds which were among the minor items served at banquets. The 1st-century Roman cookbook Apicius makes various mentions of recipes which involve a pie case. By 160 BC, Roman statesman Marcus Porcius Cato (234–149 BC), who wrote De Agri Cultura, notes the recipe for the most popular pie/cake called placenta. Also called libum by the Romans, it was more like a modern-day cheesecake on a pastry base, often used as an offering to the gods. With the development of the Roman Empire and its efficient road transport, pie cooking spread throughout Europe. Pies remained as a staple of traveling and working peoples in the colder northern European countries, with regional variations based on both the locally grown and available meats, as well as the locally farmed cereal crop. 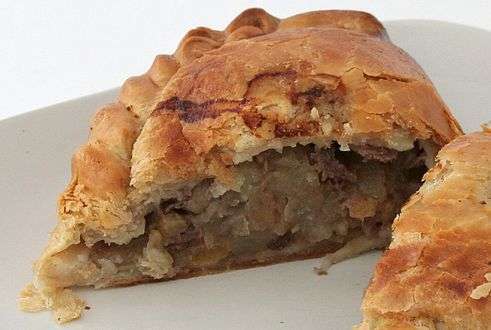 The Cornish pasty is an excellent adaptation of the pie to a working man's daily food needs. Medieval cooks had restricted access to ovens due to their costs of construction and need for abundant supplies of fuel. Pies could be easily cooked over an open fire, while partnering with a baker allowed them to cook the filling inside their own locally defined casing. The earliest pie-like recipes refer to coffyns (the word actually used for a basket or box), with straight sealed sides and a top; open-top pies were referred to as traps. The resulting hardened pastry was not necessarily eaten, its function being to contain the filling for cooking, and to store it, though whether servants may have eaten it once their masters had eaten the filling is impossible to prove. This may also be the reason why early recipes focus on the filling over the surrounding case, with the partnership development leading to the use of reusable earthenware pie cases which reduced the use of expensive flour. 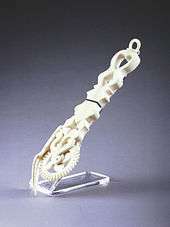 Song birds at the time were a fine delicacy and protected by Royal Law. At the coronation of eight-year-old English King Henry VI (1422–1461) in 1429, "Partryche and Pecock enhackyll" pie was served, consisting of cooked peacock mounted in its skin on a peacock-filled pie. Cooked birds were frequently placed by European royal cooks on top of a large pie to identify its contents, leading to its later adaptation in pre-Victorian times as a porcelain ornament to release of steam and identify a good pie. 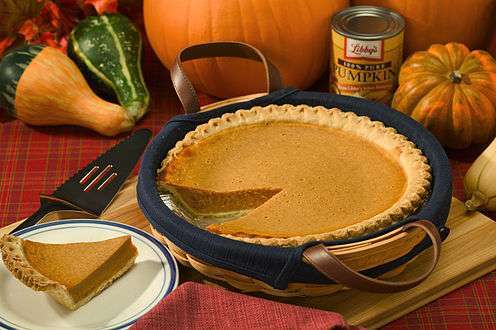 The Pilgrim fathers and early settlers brought their pie recipes with them to America, adapting to the ingredients and techniques available to them in the New World. Their first pies were based on berries and fruits pointed out to them by the Native North Americans. Pies allowed colonial cooks to stretch ingredients and also used round shallow pans to literally "cut corners" and to create a regional variation of shallow pie. 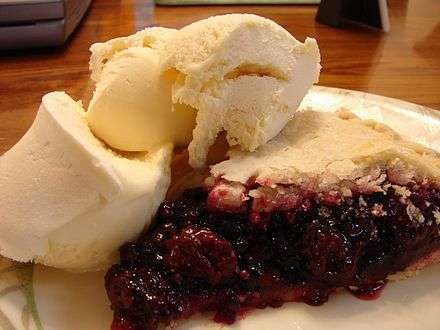 Fruit pies may be served with a scoop of ice cream, a style known in North America as pie à la mode. Many sweet pies are served this way. Apple pie is a traditional choice, though any pie with sweet fillings may be served à la mode. This combination, and possibly the name as well, is thought to have been popularized in the mid-1890s in the United States. Apple pie can be done with a variety of apples: Golden Delicious, Pink Lady, Granny Smith, and Rome Beauty. Cream filled or topped pies are favorite props for slapstick humor. Throwing a pie in a person's face has been a staple of film comedy since Ben Turpin received one in Mr. Flip in 1909. More recently, pieing has also become a political act; some activists throw cream pies at politicians and other public figures as a form of protest. ↑ "Ships Biscuits - Royal Navy hardtack". Royal Navy Museum. Retrieved 14 January 2010. 1 2 3 4 5 6 "History of Pie". whatscookingamerica.net. Retrieved 2010-07-05. ↑ "Food Pies". FoodTimeline.org. Retrieved 2010-07-05. ↑ Odile Redon; et al. (1998). The Medieval Kitchen: Recipes from France and Italy. University of Chicago Press:Chicago. ISBN 0-226-70684-2. ↑ "Pie". Encyclopædia Britannica. Chicago. Retrieved 2008-09-12. ↑ "Best Apples For Apple Pie | Stemilt". Stemilt. 2015-09-28. Retrieved 2016-11-15. ↑ "A Very Brief History of Slapstick". Splat TV. 2003. Retrieved 2009-01-29. Clarkson, Jane (2009). Pie: A Global History. Reaktion. ISBN 978-1-86189-425-0. Look up pie in Wiktionary, the free dictionary. Chisholm, Hugh, ed. (1911). "Pie". Encyclopædia Britannica (11th ed.). Cambridge University Press.